Goalkeeper Mental Course a hit! Hi Ray Hope all is well. Thanks for the videos on how to be mentally strong , as a goalkeeper. Josh is really interested in what you have to say and the way in witch you put things across and in his own way has already coped with parts one, two, three and four at the tender age of 8yrs and 8months old !! When he first represented the MK Dons he was churning on the way to the stadium to catch the team bus , long story short we had several conversations about butterflies on our way to the next few games and how that needed to be there to show he cared about his goal keeping and his team and how to turn that into adrenaline to help him perform , he used to come off the pitch totally un fazed and even started keeping clean sheets for his club Leighton Park Rangers FC witch i am the founder and Chairman of. That was when he was six , i 'me not sure when i stopped having those conversations with him , but he hasn't mentioned being nervous before a game for ages !! The second video about triggers you will love , Josh obviously got dis appointed when letting goals in and was very down hearted and got the face on , and i was obviously worried that it would go on too long and he let another one or two in as a result of not getting focused as soon as he possibly could after the dis appointment and was even more worried of going on and on at him to get on with it and compound the problem , so , whilst watching the Simpsons on telly one night Ned Flanders ( STOP LAUGHING RAY ) , Ned Flanders kids where up-set about something and he did this signal ( a trigger ) with his hands an up - side down U shape to represent a sad face with thumb and finger and turned it up the other way to make a proper U shape whilst saying "turn that frown up-side down" to make them smile and laugh again , obviously that's a bit long winded during a game ( and all the other parents would think i was a right pratt ) , so i just gave josh three sharp whistles and signalled by repeatedly turning my U shaped thumbed and finger up and down until he couldn't help but grin back at me !! We still do it to this day and he has let no more than five goals in all season and is keeping clean sheets two back to back at the indoor festival ( pictured below ) last weekend. It may well work for other youngsters you coach !!? Part three has always been pretty good as josh will always talk and organize his team when defending set plays and join in congratulating them when they score and has been developing calling ( KEEPERS ) when coming for balls with his old MK Dons coach Michael Parkin who i told you about the other week. And the fourth video has always been a part of Joshua's preparation , he always has his shirt tucked in to look smart and tall ( and will always say when the keepers on the telly come out of the tunnel , look dad smart confident keeper or scruffy keeper dad if the shirts hanging out ) , his hair spiked up to look even taller and more confident and always stays big or in his set position depending on the type of save he is about to try and make with the big white Nike gloves with the thumbs pointing up right in front of the attackers eye line and they often bottle it or get hurried into making a decision that Josh can cope with !! Well roll on part five , but thanks' again Ray , you are definitely getting inside Joshua's head !! Thanks for your lovely comments Steve, it really means a lot to me that my course is giving your child and others a positive experience and helping them build their confidence. 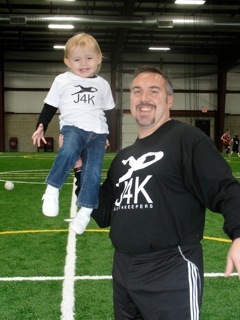 This was the reason I started J4K and will continue to put in as much effort as i can to aid young keepers worldwide. Goalkeeper Residentials and Camps everywhere!!! We are very excited to say that Just4keepers is running a spate of Residential Camps and Courses through 2011. We are VERY VERY Proud that Just4keepers touches goalkeepers all over the world now! Calling all goalkeepers, would you like FREE Goalkeeper Training in Mansfield for you or your goalkeeper or even goalkeepers. This specialised GK course is run by Just4keepers Goalkeeping Schools which is now the largest Goalkeeping coaching schools in the world operating in 4 continents. 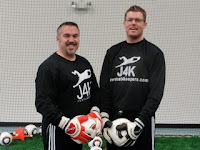 J4K has helped hundreds of young goalies get to professional soccer clubs over the past decade. And with prices starting a fiver per week, why pay silly high prices elsewhere? Just4keepers has another exciting success story to share. Nathan Dean who has been at J4k for 7 years now has just been accepted on a 4 year scholarship deal in the USA! In my opinion Nathan should have been professional goalkeeper but Nathan, Like me, is a little baffled by English football at present so what is England's loss, is now the USA's gain as Nathan now takes his talents overseas! Lets hope for the sake of our National team, we do not loose the likes of Nathan Deans too often!!! Myself and all of J4K wish Nathan the best of luck!!! If you want to follow in Nathans foot steps and you are not attending J4K, email me TODAY on info@just4keepers.co.uk. You never know, you could be our nest success story? In the month of January 2011, Just4keepers Goalkeeper Coach Andy Woodcock who normally run his goalkeeper classes in Kent UK visited Ron Tilsed who run Just4keepers Sydney (Australia). Andy commented what a great bunch of keepers attended Rons class and there was some excellent talent!!! So a big well done to Ron, who is doing a great job down under! Andy Woodcock third from right at the back and looking pink, lol and Ron in the middle at the back training the Just4keepers students in Sydney. 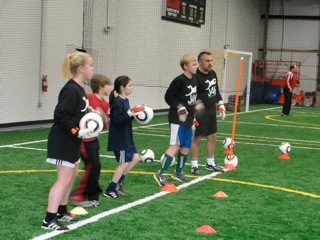 This is J4K coach Joe Weirs teaching his Just4keepers Goalkeeper students the over arm throw technique in Pennsylvania USA. In the UK we tend to use a ball, but our USA counterparts like to use students as a live demo! Joking aside, Joe and Simon (Robinson) have been doing a fantastic job running J4K in their state and have already have one of the fastest specialist goalkeeper schools in their area. A lot of budding goalkeepers ask me, for corners do you put one player on front post, one player on back post or a player on each post? The older you get and the better standard you play, normally the manager makes this decision for you and orr the team, however at a young age what would I recommend? Well, I would recommend you put a player on each post and you stand slightly off central, being more towards the back post. Basically because it’s easier to run forwards than it is backwards. Also DO NOT stand on your line, always be half a yard of your line. I hope this quick corner tip helps guys. Do not forget to goto the Just4keepers website and subscribe for FREE to all our goalkeeping tips and help! Would you like FREE Goalkeeper Coaching in Oxford for you or your goalkeeper, especially ran by Just4keepers Goalkeeper Schools which is now the biggest Goalkeeping coaching schools in the UK currently training OVER 5000 keepers every week in 12 countries! 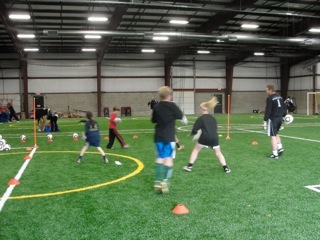 J4K has helped OVER 250 budding young goalies get to professional soccer clubs over the past decade. And with prices starting at just five pounds per session, why pay the silly high prices elsewhere?